AP Services, a product and service brand of Curtiss-Wright, is a manufacturer and integrated supplier of metal and fabricated gaskets, mechanical valve and pump packing, and a wide variety of specialized fluid sealing products for use in the power generation, chemical, pulp & paper, and refining industries. 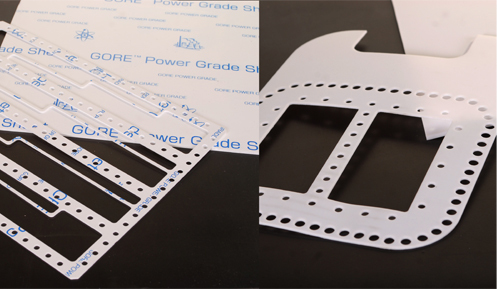 AP Services, a product and service brand of Curtiss-Wright, has state-of-the-art gasket manufacturing technology using CNC driven water jet cutters. Polytetrafluoroethylene (PTFE) is a thermoplastic member of the fluoropolymer family of plastics. PTFE has a low coefficient of friction, excellent insulating properties, and is chemically inert to most substances. It also can withstand high heat applications and it is well know for its anti-stick properties. Style 720 Mechanical Grade PTFE- Manufactured from 100% reprocessed PTFE. Style 720 can handle virtually all chemicals in the 0-14 pH range with the exception of molten alkali metals and elemental fluorine. It is recommended for fuels, lubricants, caustics, and acids at temperatures up to 500°F. Style 720’s tensile strength is 1500 psi. Dielectric (Volts/Mil)- 1300. Style 724 Glass Filled PTFE- Manufactured from virgin PTFE and reinforced with glass fibers. With similar qualities as Style 720 and 730, Style 724 has as much as 40% higher compressive properties and improves wear resistance greatly due to the addition of glass. These compounds resist acids and oxidation, but can be attacked by alkali. It is recommended for fuels, lubricants, caustics, and acids at temperatures up to 500°F. Style 724’s tensile strength is 1000 psi.